It's time! It's back! this is the event I so wish it comes earlier, SolidWorks Innovation Day 2011. This year, we have a very serious topic: Winning in Business. Well, I can't disclose much on the details, but what I can say, this year the topics are more focusing on how a CAD system play an important element to help you win in you business. Well, this blog will totally lack of attractiveness if I didn't mention anything about prizes. As a give back to you who attend our event this year, you stand a chance to win BIG prizes. I'm referring to HP notebook, Ipad 2 & Dell notebook. A simple, very simple step you need to do and you are one of them who can win the prize. For more detail, Log on to www.imetech.com.my/SWID2011 to register and find out more. Keep follow up with my blog for time to time update about the event. 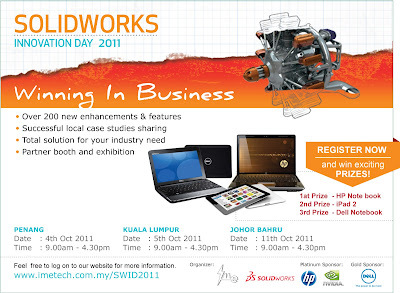 Solid Works 2012 Join us at the SolidWorks Innovation day to witness.